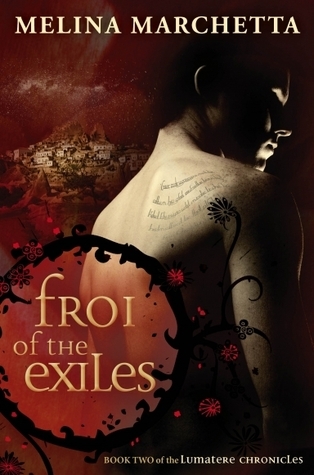 Froi travels to Charyn to assassinate the King, disguised as Olivier, the last born of Sebastabol, who was being sent to the palace to bed the princess Quintana. With Quintana’s birth, the kingdom has been infertile and she is prophesied to give birth to the cursebreaker with one of the lastborns of the land. While at the palace, Froi meets Gargaroi and Arjuro of Abroi and Lirah of Serker. He finds out later that Lirah and Gargaroi are his parents. Froi sleeps with Quintana, but someone kills the Ling before he can get to him. Froi, Gargaroi, Arjuro, Lirah and Quintan escape Citavita after the street lords invade the palace. Quintana is pregnant, and insists they go to Turla. They find out that the Oracle, Quintana’s mother was in truth a girl from Turla named Solange. Arjuro sings Solange and her dead daughter’s souls to rest. The five take refuge in Paladozza. When Feliciano of Avanosh arrives to take Quintana as his bride and act as regent, Froi and Quintana escape. Olivier betrays them, leading them straight to Bestiano, in the false hope that he will keep Quintana safe. Froi tells Quintana to run, and fends off the soldiers. But he is gravely injured and loses consciousness. Someone rescues him from the grasp of the soldiers and takes him to the Priests of Trist, where Arjuro heals him. Quintana seeks refuge with Phaedra and the Charynite women staying on the Lumateran valley. Charynites have begun to take refuge in the valley just outside Lumatere, on the other side of Lucian’s mountain. When they are refused a meeting with the Queen or Finnikin, one of them, Rafuel of Sebastabol, threatens to kill Japhra. They take him prisoner, and when Finn, along with Travanion, Perri, Lucian and Froi, goes to see him, they hear a strange story. Nineteen years ago, the godshouse in Citavita was attacked, the Oracle raped and all the Priestlings murdered. Arjuro of Abroi, who was absent that night, was charged with assisting the murders and imprisoned. The King took the Oracle into the palace to keep her safe, and nine months later, when the Lirah of Serker, the King’s mistress gave birth to the Princess Quintana, the Oracle jumped to her death into the ravine beyond the palace. Since then, the fertility of Charyn ended. When Quintana was thirteen, she prophesied, “The last shall make the first.” On her thirteenth birthday, when the Kind ordered every lastborn girl to be marked, Quintana claimed that she was the chosen vessel for the first baby, which would be conceived before she came of age. For the last three years, one lastborn from each province has attempted to conceive the child with the Princess, but failed. Rafuel asks them to send Froi in place of the Olivier, the lastborn from Sebastabol, to the palace to bed the Princess. While there, he could kill the King, and bring a fitting end to a King who brought pain to both his own kingdom and Lumatere. Froi travels upto the ravine outside the capital with Zabat, one of Rafuel’s students, and from there, is accompanied to the palace by Gargarin of Abroi. Gargarin is Arjuro’s brother, and though not gods’ touched, he is an exceptionally intelligent man, respected by even the highest officials. When he sees Froi, he recoils from him, shocked, before he controls his emotions. Froi and Gargarin stay at the palace in a room adjacent to Quintana. Every night, Froi refuses to bed her, but slowly comes to feel an amused fondness for her. She appears to have a split personality, one minute an indignant princess, innocent of most things, and the next, an ice queen, cutting and snarling at anyone she meets. Froi discovers that Bestiano, the King’s First Advisor, rapes her regularly. He meets the Priestling Arjuro, who was freed by the King. Strangely, he has the same reaction to him as Gargarin did. He also gets to know Lirah of Serker, who is imprisoned for trying to kill Quintana when she was a child. He learns that it was the King who raped the Oracle, and on the night Quintana was born, there were two babies born in the palace – one to Lirah, and the other to the Oracle. Gargarin, who wanted to get into the King’s good graces and free Arjuro, was charged with disposing off the first child, and the Oracle into the ravine. Except, it was Lirah’s child he killed, and not the Oracle’s. When Gargarin hears this, he seems both devastated and hopeful. In those days, Gargarin also had a relationship with Lirah. Quintana’s brithday is fast approaching, and if she’s is not carrying before then, the people will kill her, for they see her as the cursemaker. On the night before her birthday, Froi sleeps with her. The next morning, when he goes to kill the King, he sees Gargarin on the same errand, and tries to dissuade him. But before either of them can get to the King, they find out that he has already been killed, by Bestiano, with Quintana as witness. Before Froi can get the Quintana, both he and Gargarin are locked into their room. The street lords (thugs) of Citavita start invading the palace, throwing every person of power into the ravine below. Gargarin urges Froi to go to Lirah and escape by saying they were both the King’s prisoners. He also tells him that the baby he was ordered to kill that night was not killed, but smuggled out of the palace and sent to the priests who had gone underground. Froi and Lirah escape to the godshouse, where several people have taken refuge with Arjuro. When Arjuro, Lirah and DeLancey (the Provincaro of Paladozza, also Arjuro’s ex lover) hear Gargarin’s tale, they are shocked. Arjuro figures out that Froi is the baby who was smuggled out that night, Gargarin and Lirah’s son. Not only does he bear Serker eyes, but he is a spitting image of Gargarin and Arjuro’s father, an evil man. His real name is Dafar of Abroi, and he was named by Arjuro, who was with the priests when the baby was delivered to them. When the street lords attempt to throw Gargarin into the ravine, Froi stops them, offering to pay Isaboe’s ruby ring as ransom. They take it, but ask for three hundred gold coins in addition to set him free. DeLancy makes arrangements for the payment. One by one, the everyone related to the king is hanged, When at last, only Gargarin and Quintana are left, Gargarin is released, and Quintana is taken to be hanged. She cries that she is carrying a child, and is paid no heed. But the lastborns of the provinces – Satch of Desantos, Olivier of Sebastabol, and Grijio of Paladozza – stage a rescue attempt and Froi saves Quintana. They go underground, to Tariq of Lascow, Quintana’s betrothed, who had been smuggled out of the palace years ago. Tariq says that they are soon expecting an envoy from Paladozza to take them to safer ground. When Froi tries to leave Quintana, she holds on to him, so he lies to her that he was sent to assassinate her. Froi returns to Citavita, only to discover that DeLancey hadn’t sent any envoy at all. When he returns to the caves, he finds everybody slaughtered. Quintana is alive because Tariq had wrapped her in bandages, disguising her as one of their dead. They return to Citavita, where Quintana ditches Froi. He finds out later that she left the city with Lirah, disguised as a boy. Froi, Arjuro and Gargarin leave the city and head in different directions, but end up in the same ravine where Froi and Gargarin first met. They suspect that it is where Lirah and Quintana would’ve headed as it was the only place Lirah has felt safe, back when she was in love with Gargarin. Before they can get to the women, the Citavita’s soldiers find them first. Froi rescues them and all five hide in the caves. Quintana confesses that it was she who killed the King. She is vicious towards Froi, and since the others support her, he is forced to stay in a different cave. He steals a basket of fish from one of the soldiers, gives them to Arjuro, and leads the soldiers away from his friends. He decides to make his way back to Lumatere. The street lords of Citavita arrive at the Lumateran valley where the Charynites have taken refuge, looking for Rafuel. They kill all his students, and are search for last born women. Lucian manages to sve Phaedra, his wife, and the only last born woman in the valley. He makes it to a small village, before he dreams of Quintana and returns. They travel to Jidia through the long lost Steps of Jidia. The Provincara of Jidia refuses to house them, but pledges Jidia’s army to the Queen should the need arise. Upon Quintana’s insistance, they go to Turla, where they find that the Oracle was a girl names Solange, and the Dying Man of Turla is her father, waiting to take her spirit home with her. Arjuro sings Solange’s, and the Regina’s (Quintana’s twin, whose spirit lived within her) souls to rest. They seek refuge in Paladozza. Feliciano of Avanosh ,whom majority of the Provincari have deemed the perfect regent, comes with his entourage, seeking Quintana’s hand. With Olivier’s help, Froi & Quintana escape, but Olivier leads them straight to a trap, to Bestiano’s men. Froi holds them off, and tells Quintana to run. When Phaedra goes to visit the women in the valley, she discovers that they have the plague. Rafuel confirms it. The women are kept isolated deep in the woods, and by the end of the week, they are all dead, including Phaedra. A Charynite comes to Lumatere with Isaboe’s ruby ring, and swears that Gargarin is the mastermind behind the imposter King’s rule in Lumatere. The Lumaterans hatch a plan to trap and assassinate Gargarin. Froi wakes up, gravely injured, in the underground chambers of the Priests of Trist with Arjuro. Someone left him at their doorstep when he was near death. The Charynite women of the valley do not have the plague. Quintana had come to them seeking refuge because she knew Froi trusted Phaedra. The women are now hiding in one of the caves some distance from the woods. Oracle: One who is gods’ touched and comes with the great abilities.